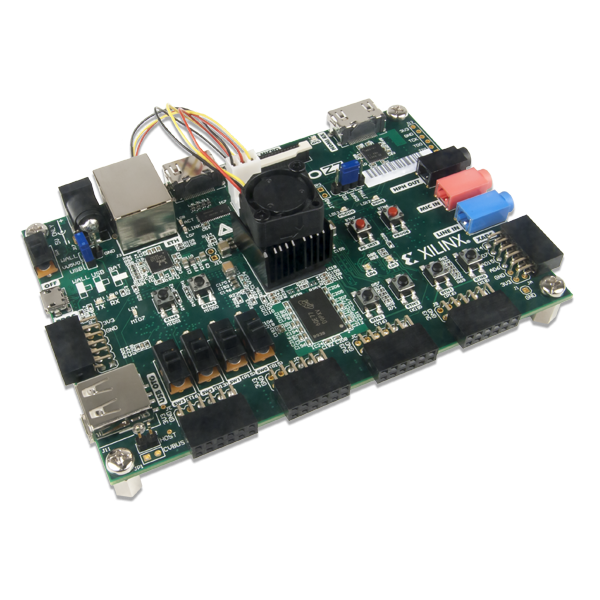 The Zybo Z7 is a feature-rich, ready-to-use embedded software and digital circuit development board built around the Xilinx Zynq-7000 family. The Zynq family is based on the Xilinx All Programmable System-on-Chip (AP SoC) architecture, which tightly integrates a dual-core ARM Cortex-A9 processor with Xilinx 7-series Field Programmable Gate Array (FPGA) logic. The Zybo Z7 surrounds the Zynq with a rich set of multimedia and connectivity peripherals to create a formidable single-board computer, even before considering the flexibility and power added by the FPGA. 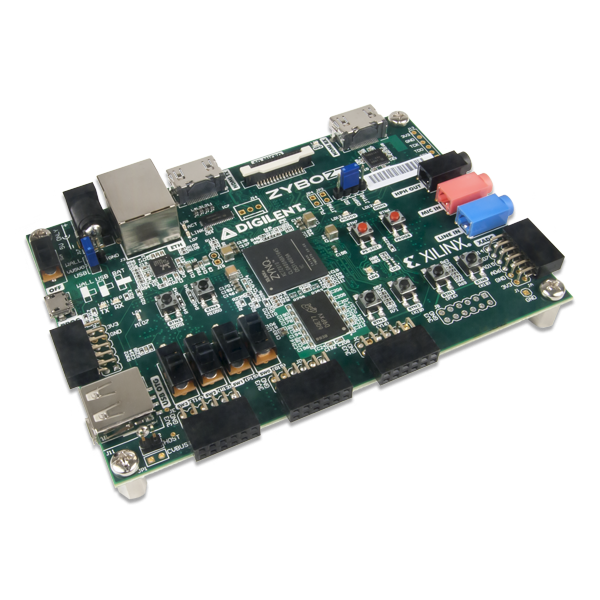 The Zybo Z7's video-capable feature set, including a MIPI CSI-2 compatible Pcam connector, HDMI input, HDMI output, and high DDR3L bandwidth, was chosen to make it an affordable solution for the high end embedded vision applications that Xilinx FPGAs are popular for. Attaching additional hardware is made easy by the Zybo Z7's Pmod connectors, allowing access to Digilent's catalog of over 70 Pmod peripheral boards, including motor controllers, sensors, displays, and more. The Zybo Z7 is a direct replacement for the popular Zybo development board, which will soon be phased out of production. The designs are very similar, however the Zybo Z7 adds several features and performance improvements. To assist in migrating from the Zybo to the Zybo Z7, Digilent has created a migration guide, available on the Zybo Z7 Resource Center. 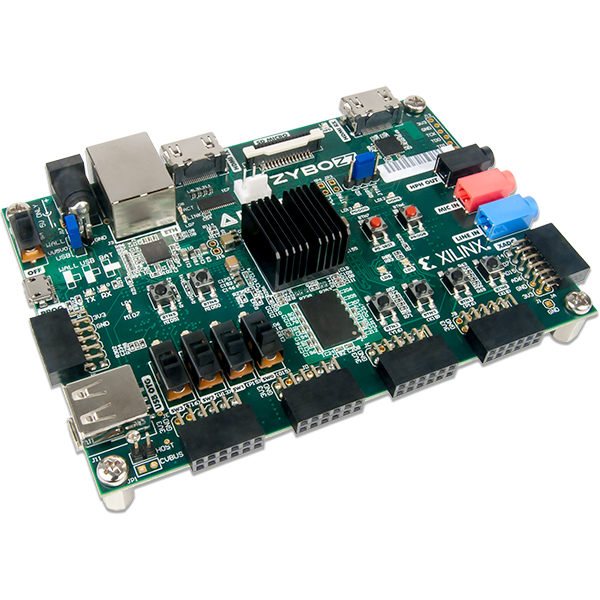 The Zybo Z7 can be purchased with either a Zynq-7010 or Zynq-7020 loaded. These two Zybo Z7 product variants are referred to as the Zybo Z7-10 and Zybo Z7-20, respectively. When Digilent documentation describes functionality that is common to both of these variants, they are referred to collectively as the “Zybo Z7”. When describing something that is only common to a specific variant, the variant will be explicitly called out by its name. The Zybo Z7-20 includes a heat sink in order to dissipate the extra heat generated from the additional FPGA resources when running complex, fast-switching designs. 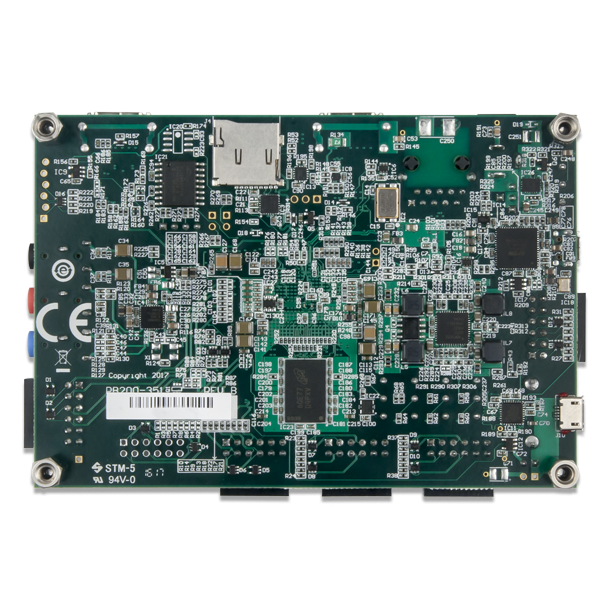 The board can be purchased stand-alone or with a voucher to unlock the Xilinx SDSoC toolset. The SDSoC voucher unlocks a 1 year license that can be used with the Zybo Z7. After the license expires, any version of SDSoC that was released during this 1 year period can continue to be used indefinitely. For more information on purchasing, see the Zybo Z7 Product Page. At the time of purchase, it is also possible to add-on a microSD card, 5V 2.5A power supply, and micro USB cable as needed. A small fan ( Zybo Z7 Fan Datasheet) that attaches to the heat sink can be added on to the Zybo Z7-20 too, however this fan will not work with the Zybo Z7-10. Note that due to the smaller FPGA in the Zynq-7010, it is not very well suited to be used in SDSoC for embedded vision applications. We recommend people purchase the Zybo Z7-20 if they are interested in these types of applications. 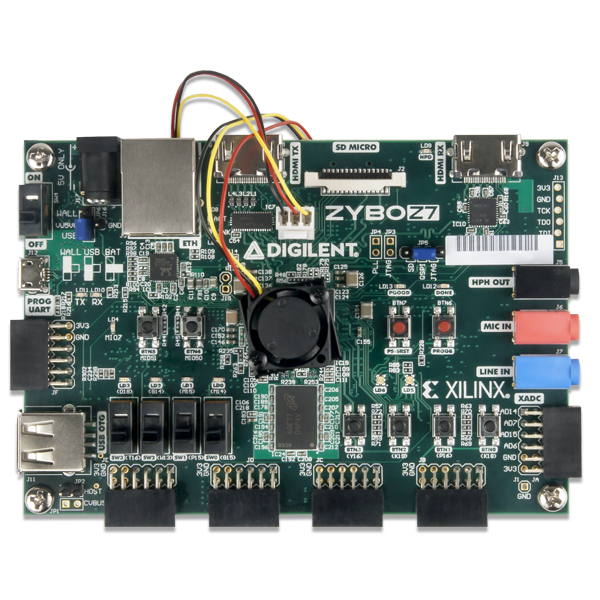 The Zybo Z7 is fully compatible with Xilinx’s high-performance Vivado ® Design Suite. This tool set melds FPGA logic design and embedded ARM software development into an easy to use, intuitive design flow. It can be used for designing systems of any complexity, from a complete operating system running multiple server applications, down to a simple bare-metal program that controls some LEDs. It is also possible to treat the Zynq AP SoC as a standalone FPGA for those not interested in using the processor in their design. The Zybo Z7 is supported under Vivado's free WebPACK™ license, which means the software is completely free to use, including the Logic Analyzer and High-level Synthesis (HLS) features. The Logic Analyzer assists with debugging logic that is running in hardware, and the HLS tool allows you to compile C code directly into HDL. Design resources, example projects, and tutorials are available for download at the Zybo Z7 Resource Center. 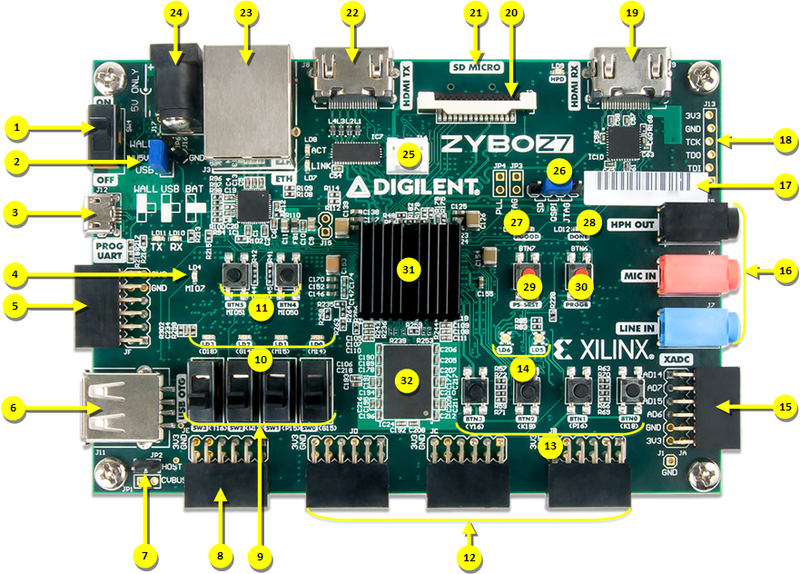 Zynq platforms are well-suited to be embedded Linux targets, and Zybo Z7 is no exception. Digilent currently does not provide a Petalinux example for this product, however one will be available in the near future on the Zybo Z7 Resource Center. 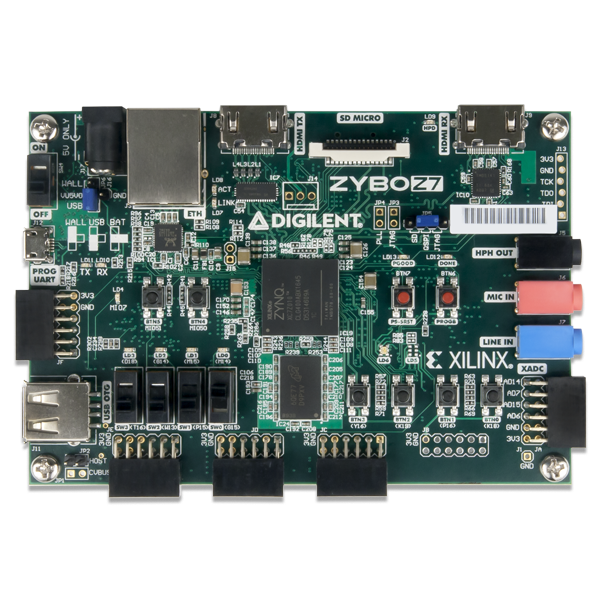 The Zybo Z7 can also be used in Xilinx's SDSoC environment, which allows you to design FPGA accelerated programs and video pipelines with ease in an entirely C/C++ environment. For more information on SDSoC, see the Xilinx SDSoC Site. Digilent will be releasing a video capable platform with Linux and OpenCV support in the near future. Note that due to the smaller FPGA in the Zybo Z7-10, only very basic video processing demos will be included with that platform. Digilent recommends the Zybo Z7-20 for those interested in video processing. Those familiar with the older Xilinx ISE/EDK toolsets from before Vivado was released can also choose to use the Zybo Z7 in that tool set. Digilent does not provide materials to support this, but you can always ask for help on the Digilent Forum. The Zynq APSoC is divided into two distinct subsystems: The Processing System (PS) and the Programmable Logic (PL). The figure below shows an overview of the Zynq APSoC architecture, with the PS colored light green and the PL in yellow. Note that the PCIe Gen2 controller and Multi-gigabit transceivers are not available on the Zynq-7020 or Zynq-7010 devices. The PL is nearly identical to a Xilinx 7-series Artix FPGA, except that it contains several dedicated ports and buses that tightly couple it to the PS. The PL also does not contain the same configuration hardware as a typical 7-series FPGA, and it must be configured either directly by the processor or via the JTAG port. The PS consists of many components, including the Application Processing Unit (APU, which includes 2 Cortex-A9 processors), Advanced Microcontroller Bus Architecture (AMBA) Interconnect, DDR3 Memory controller, and various peripheral controllers with their inputs and outputs multiplexed to 54 dedicated pins (called Multiplexed I/O, or MIO pins). Peripheral controllers that do not have their inputs and outputs connected to MIO pins can instead route their I/O through the PL, via the Extended-MIO (EMIO) interface. The peripheral controllers are connected to the processors as slaves via the AMBA interconnect, and contain readable/writable control registers that are addressable in the processors’ memory space. The programmable logic is also connected to the interconnect as a slave, and designs can implement multiple cores in the FPGA fabric that each also contain addressable control registers. Furthermore, cores implemented in the PL can trigger interrupts to the processors and perform DMA accesses to DDR3 memory. There are many aspects of the Zynq APSoC architecture that are beyond the scope of this document. For a complete and thorough description, refer to the Zynq Technical Reference manual. The table below depicts the external components connected to the MIO pins of the Zybo Z7. The Vivado board files found on the Zybo Z7 Resource Center can be used to properly configure the PS to work with these peripherals. It is also possible to use the example projects found on the resource center as a starting point for your own designs. The Zybo Z7 power circuitry was carefully designed to meet the requirements of the Zynq-7000 and all other peripherals while also providing flexible input supply options. An overview of the power circuit is shown in Figure 1.1. All on-board power supplies are enabled or disabled by the power switch (SW4). The power indicator LED (LD13, labeled PGOOD) is on when all the supply rails reach their nominal voltage. The Zybo Z7 can be powered from several different sources. Jumper JP6 (near the power switch) determines which power source is used. There are three valid configurations for this jumper corresponding to the three powering options: USB, wall wart supply with barrel jack, and battery pack. Figure 1.1 depicts all three, and a diagram on the board silkscreen does as well. The recommended power source is an external power supply (such as a wall-wart) with a barrel jack connector (also known as a coaxial power connector). The supply must use a center-positive 2.1mm internal-diameter plug and deliver between 4.5V to 5.5V DC. It should also be able to output at least 2.5 A (12.5 Watts) in order to support power hungry Zynq projects and external peripherals. To use an external supply with a barrel jack, plug it into the power jack (J17), set jumper JP6 to “WALL”, and then set SW4 to “ON”. Suitable supplies can be purchased from the Digilent website or Digilent distributors, as well as popular electronics vendors. An external power source, such as a battery pack, that does not have a suitable barrel jack connector can still be used by wiring it’s positive terminal to the center pin of JP6 and the negative terminal to the pin labeled J16 next to JP6. The external supply must still meet the same voltage and current requirements as a supply attached to the barrel jack. It is also possible to power the Zybo Z7 from the USB programming port (J12), however the Zybo Z7 often requires more current than the 0.5 A of current that is allowed by a USB 2.0 device. If this limit is exceeded, many USB hosts will begin to droop the voltage briefly until the Zybo Z7 resets, dropping current consumption into acceptable ranges. To help prevent this, a USB host port should be chosen that can support higher current (often referred to as a “fast charging USB port” or similar by laptop/PC vendors). Many USB battery packs and wall supplies will also support higher current draws. Even when attached to a host capable of providing more current, the Zybo Z7 will limit itself to .75 A, and will reset if this current is reached. If you experience your project resetting (indicated by a brief flicker on the PGOOD LED and the DONE LED turning off) while powered from a high current USB port, you will either need to lower the power consumption of your project or use an external power source. For reference, we found that the out of box demo loaded on the Zybo Z7 at the factory consumes about 0.5 A from the input power source. More demanding applications, including any that drive multiple peripheral boards or other USB devices, will likely draw more. The Zybo Z7 has over-voltage protection up to 20 V on all power inputs that will kick in when a voltage of greater than 5.7 V is detected on the selected input. It will also limit current draw to .75 A when powered from USB and 4 A when powered from an external source. This protection is implemented using a Texas Instruments TPS25940 eFuse, please refer to its datasheet for further specifications. Table 1.1.1 provides an overview of the power input specifications for the Zybo Z7. Table 1.2.1 describes the characteristics the Zybo Z7's on-board power rails. It can be used to estimate power consumption for a project, or determine how much current attached peripherals can draw before being limited. Input power to the board is gated by the TPS25940, a protection circuit providing both inrush and general current limit, over-voltage protection and current sense. Inrush current is limited by a ~4ms soft-start time. The supply rails downstream are daisy-chained to follow the Xilinx-recommended start-up sequence. Flicking the power switch (SW4) will enable the 1.0V rail, which enables the 1.8V digital supply rail, which in turn enables the I/O supply rails 3.3V and 1.35V. The 1.25V reference and 1.8V analog supply ramp together with the 3.3V rail. Once all the channels of the ADP5052 (IC25) supply reach regulation, the PGOOD signal will assert, enabling the 3.3V audio supply, lighting up the power LED (LD13), and de-asserting the Power-On Reset signal (PS_POR_B) of the Zynq. Each power supply uses a soft-start ramp of 1-10ms to limit in-rush current. There is an additional delay of at least 130ms after the power rails reach regulation and before the Power-On Reset signal de-assert to allow for the PS_CLK (IC22) to stabilize. The current being consumed by the Zybo Z7 from the power input can be monitored using the IMON signal of the TPS25940 eFuse device (IC26). The voltage on the IMON signal is directly proportional to the current being consumed, and is connected to the dedicated analog input pair on the Zynq-7000 (V_P/V_N) so it can be measured using the internal ADC (called the XADC core). For information on how to use the XADC core, please see section “16.3 Dual Analog/Digital Pmod (XADC Pmod)”. It is recommended that 256 averaging mode be used for more accurate results. Once a 12-bit value is obtained from the XADC, you can use the equation in Figure 1.4.1 to convert it to current consumption. X is the 12-bit value from the XADC and I is the current consumption in Amps. Be careful not to use the 16-bit value obtained directly from the XADC registers with this equation; it needs to be right-shifted by four in order to ignore the four least significant bits. After the Zybo Z7 is powered on or the Zynq is reset (in software or by pressing PS-SRST), one of the processors (CPU0) begins executing an internal piece of read-only code called the BootROM. If and only if the Zynq was just powered on, the BootROM will first latch the state of the mode pins into the mode register (the mode pins are attached to JP5 on the Zybo Z7). If the BootROM is being executed due to a reset event, then the mode pins are not latched, and the previous state of the mode register is used. This means that the Zybo Z7 needs a power cycle to register any change in the programming mode jumper (JP5). Next, the BootROM copies an FSBL from the form of non-volatile memory specified by the mode register to the 256 KB of internal RAM within the APU (called On-Chip Memory, or OCM). The FSBL must be wrapped up in a Zynq Boot Image in order for the BootROM to properly copy it. The last thing the BootROM does is hand off execution to the FSBL in OCM. During this stage, the FSBL first finishes configuring the PS components, such as the DDR memory controller. Then, if a bitstream is present in the Zynq Boot Image, it is read and used to configure the PL. Finally, the user application is loaded into memory from the Zynq Boot Image, and execution is handed off to it. The last stage is the execution of the user application that was loaded by the FSBL. This can be any sort of program, from a simple “Hello World” design, to a Second Stage Boot loader used to boot an operating system like Linux. For a more thorough explanation of the boot process, refer to Chapter 6 of the Zynq Technical Reference manual. The Zynq Boot Image is created using Vivado and Xilinx Software Development Kit (Xilinx SDK). For information on creating this image please refer to the available Xilinx documentation for these tools. The Zybo Z7 supports three different boot modes: microSD, Quad SPI Flash, and JTAG. The boot mode is selected using the Mode jumper (JP5), which affects the state of the Zynq configuration pins after power-on. Figure 2.1 depicts how the Zynq configuration pins are connected on the Zybo Z7. Figure 2.1. Zybo Z7 configuration pins. The three boot modes are described in the following sections. Format the microSD card with a FAT32 file system. Copy the Zynq Boot Image created with Xilinx SDK to the microSD card. Rename the Zynq Boot Image on the microSD card to BOOT.bin. Eject the microSD card from your computer and insert it into connector J4 on the Zybo Z7. Attach a power source to the Zybo Z7 and select it using JP6. Place a single jumper on JP5, shorting the two leftmost pins (labeled “SD”). Turn the board on. The board will now boot the image on the microSD card. Place a single jumper on JP5, shorting the two center pins (labeled “QSPI”). Turn the board on. The board will now boot the image stored in the Quad SPI flash. When placed in JTAG boot mode, the processor will wait until software is loaded by a host computer using the Xilinx tools. After software has been loaded, it is possible to either let the software begin executing, or step through it line by line using Xilinx SDK. It is also possible to directly configure the PL over JTAG, independent of the processor. This can be done using the Vivado Hardware Server. The Zybo Z7 is configured to boot in Cascaded JTAG mode, which allows the PS to be accessed via the same JTAG port as the PL. It is also possible to boot the Zybo Z7 in Independent JTAG mode by loading a jumper in JP3 and shorting it. This will cause the PS to not be accessible from the onboard JTAG circuitry, and only the PL will be visible in the scan chain. To access the PS over JTAG while in independent JTAG mode, users will have to route the signals for the PJTAG peripheral over EMIO, and use an external device to communicate with it. The Zybo Z7 includes two Micron MT41K256M16HA-125 DDR3L memory components creating a single rank, 32-bit wide interface and a total of 1 GiB (Gibi-byte, or 1,073,741,824 bytes) of capacity. The DDR3L is connected to the hard memory controller in the Processor Subsystem (PS), as outlined in the Zynq documentation. The PS incorporates an AXI memory port interface, a DDR controller, the associated PHY, and a dedicated I/O bank. DDR3L memory interface speeds up to 533 MHz/1066 Mbps are supported. Zybo Z7 was routed with 40 ohm (+/-10%) trace impedance for single-ended signals, and differential clock and strobes set to 80 ohms (+/-10%). A feature called DCI (Digitally Controlled Impedance) is used to match the drive strength and termination impedance of the PS pins to the trace impedance. On the memory side, each chip calibrates its on-die termination and drive strength using a 240 ohm resistor on the ZQ pin. Due to layout reasons, the two lower data byte groups (DQ[0-7], DQ[8-15]) were swapped. To the same effect, the data bits inside byte groups were swapped as well. These changes are transparent to the user. During the whole design process the Xilinx PCB guidelines were followed. Both the memory chips and the PS DDR bank are powered from the 1.35V supply. The mid-point reference of 0.675V is created with a simple resistor divider and is available to the Zynq as external reference. For proper operation it is essential that the PS memory controller is configured properly. Settings range from the actual memory flavor to the board trace delays. For your convenience, the Zybo Z7 Vivado board files are available on the Zybo Z7 Resource Center and automatically configure the Zynq Processing System IP core with the correct parameters. For best DDR3L performance, DRAM training is enabled for write leveling, read gate, and read data eye options in the PS Configuration Tool in Xilinx tools. Training is done dynamically by the controller to account for board delays, process variations and thermal drift. Optimum starting values for the training process are the board delays (propagation delays) for certain memory signals. Board delays are specified for each of the byte groups. These parameters are board-specific and were calculated from the PCB trace length reports. The DQS to CLK Delay and Board Delay values are calculated specific to the Zybo Z7 memory interface PCB design. For more details on memory controller operation, refer to the Xilinx Zynq Technical Reference manual. Zynq configuration clock speeds up to 94 MHz. The Flash memory is used to provide non-volatile code and data storage. It can be used to initialize the PS and PL of the Zynq device with a Zynq Boot Image (also known as BOOT.BIN) generated using Xilinx tools such as Petalinux or Xilinx SDK. For information on booting the Zybo Z7 with a Zynq Boot image, see section “2.2 Quad SPI Boot Mode”. The Flash is also commonly used to store non-configuration data needed by the application. If doing this from a bare-metal application, The flash memory can be freely accessed using standalone libraries included with a Xilinx SDK BSP project. If doing this from a Petalinux generated embedded Linux system, the Flash can be partitioned as desired and mounted/accessed like a standard MTD block device. See the Petalinux and Xilinx SDK documentation for more information. The Flash connects to the Quad-SPI Flash controller of the Zynq-7000 PS via pins in MIO Bank 0/500 (specifically MIO[1:6,8]), as outlined in the Zynq Technical Reference Manual. Quad-SPI feedback mode is used, thus qspi_sclk_fb_out/MIO is left to freely toggle and is connected only to a 20K pull-up resistor to 3.3V. This allows a Quad-SPI clock frequency greater than FQSPICLK2. The details of these connections do not need to be known when using the Zybo Z7 Vivado Board files, as they will automatically configure your project to work correctly with the on-board Flash. A globally unique MAC address is programmed into the One-Time-Programmable (OTP) region of the Flash on each Zybo Z7 at the factory. For more information on this, see section “10 Ethernet”. The OTP region also includes a factory-programmed read-only 128-bit random number. The very lowest address range [0x00;0x0F] can be read to access the random number. See the Spansion S25FL128S datasheet for information on this random number and accessing the OTP region. The Zybo Z7 provides a 33.3333 MHz clock to the Zynq PS_CLK input, which is used to generate the clocks for each of the PS subsystems. The 33.3333 MHz input allows the processor to operate at a maximum frequency of 667 MHz and the DDR3 memory controller to operate at a maximum clock rate of 533 MHz (1066 MT/s). The Zybo Z7 board files, available on the Zybo Z7 Resource Center, will automatically configure the Zynq processing system IP core in Vivado to work with all PS attached devices, including the 33.3333 MHz input oscillator. The PS has a dedicated PLL capable of generating up to four reference clocks, each with settable frequencies, that can be used to clock custom logic implemented in the PL. Additionally, The Zybo Z7 provides an external 125 MHz reference clock directly to pin K17 of the PL. The external reference clock allows the PL to be used completely independently of the PS, which can be useful for simple applications that do not require the processor. The PL of the Zynq-Z7010 also includes two MMCM’s and two PLL’s that can be used to generate clocks with precise frequencies and phase relationships. Any of the four PS reference clocks or the 125 MHz external reference clock can be used as an input to the MMCMs and PLLs. For a full description of the capabilities of the Zynq PL clocking resources, refer to the “7 Series FPGAs Clocking Resources User Guide” available from Xilinx. Xilinx offers the Clocking Wizard IP core to assist in integrating the MMCM's and PLL's into a design. This wizard will properly instantiate the needed MMCMs and PLLs based on the desired frequencies and phase relationships specified by the user. The wizard will then output an easy-to-use wrapper component around these clocking resources that can be inserted into the user’s design. The clocking wizard can be accessed from within the Vivado and IP Integrator tools. Figure 5.1 outlines the clocking scheme used on the Zybo Z7. Note that the reference clock output from the Ethernet PHY is used as the 125 MHz reference clock to the PL, in order to cut the cost of including a dedicated oscillator for this purpose. Keep in mind that CLK125 will be disabled when the Ethernet PHY is held in hardware reset by driving the PHYRSTB signal low. Figure 5.1. Zybo Z7 clocking. The Zybo Z7 provides several different methods of resetting the Zynq-7000 device, as described in the following sections. The Zynq PS supports external power-on reset signals. The power-on reset is the master reset of the entire chip. This signal resets every register in the device capable of being reset. The Zybo Z7 drives this signal from the PWRGD signal of the ADP5052 power regulator in order to hold the system in reset until all power supplies are valid. A red push button, labeled PROGB, toggles the Zynq-7000's PROG_B input. This resets the PL and causes DONE to be de-asserted. The PL will remain unconfigured until it is reprogrammed by the processor or via JTAG. The external system reset button, labeled PS-SRST, resets the Zynq device without disturbing the debug environment. For example, the previous break points set by the user remain valid after system reset. Due to security concerns, system reset erases all memory content within the PS, including the On-Chip-Memory (OCM). The PL is also cleared during a system reset. System reset does not cause the boot mode strapping pins to be re-sampled. After changing boot moode jumpers a power cycle is needed to act on the new setting. The Zybo Z7 includes an FTDI FT2232HQ USB-UART bridge (attached to connector J12) that lets you use PC applications to communicate with the board using standard COM port commands (or the tty interface in Linux). Drivers are automatically installed in Windows and newer versions of Linux when the Zybo Z7 is attached. Serial port data is exchanged with the Zynq using a two-wire serial port (TXD/RXD). After the drivers are installed, I/O commands can be used from the PC directed to the COM port to produce serial data traffic on the Zynq pins. The port is tied to PS (MIO) pins and can be used in combination with the UART 1 controller. The Zynq presets file (available in the Zybo Z7 Resource Center) takes care of mapping the correct MIO pins to the UART 1 controller and uses the following default protocol parameters: 115200 baud rate, 1 stop bit, no parity, 8-bit character length. Two on-board status LEDs provide visual feedback on traffic flowing through the port: the transmit LED (LD11) and the receive LED (LD10). Signal names that imply direction are from the point-of-view of the DTE (Data Terminal Equipment), in this case the PC. The FT2232HQ is also used as the controller for the Digilent USB-JTAG circuitry, but the USB-UART and USB-JTAG functions behave entirely independent of one another. Programmers interested in using the UART functionality of the FT2232 within their design do not need to worry about the JTAG circuitry interfering with the UART data transfers, and vice-versa. The combination of these two features into a single device allows the Zybo Z7 to be programmed, communicated with via UART, and powered from a computer attached with a single Micro USB cable. The connections between the FT2232HQ and the Zynq-7000 are shown in Figure 7.1. The Zybo Z7 provides a microSD slot (J4) for non-volatile external memory storage as well as booting the Zynq. The slot is wired to Bank 1/501 MIO[40-45], and also includes a card detect signal attached to MIO 47. On the PS side peripheral SDIO 0 is mapped out to these pins and controls communication with the SD card. The pinout can be seen in Table 8.1. The peripheral controller supports 1-bit and 4-bit SD transfer modes, but does not support SPI mode. Based on the Zynq Technical Reference Manual, SDIO host mode is the only mode supported. The SD slot is powered from 3.3V, but is connected through MIO Bank 1/501 (1.8V). Therefore, a TI TXS02612 level shifter performs this translation. The TXS02612 is actually a 2-port SDIO port expander, but only its level shifter function is used. The connection diagram can be seen on Figure 8.1. Mapping out the correct pins and configuring the interface is handled by the Zybo Z7 board files, available on the Zybo Z7 resource center. Both low speed and high speed cards are supported, the maximum clock frequency being 50 MHz. A Class 4 card or better is recommended. Refer to section “2.1 microSD Boot Mode” for information on how to boot from a microSD card that contains a Zynq Boot Image. The microSD is also commonly used to store non-configuration data needed by the application. If doing this from a bare-metal application, the microSD card can be freely accessed using standalone libraries included with a Xilinx SDK BSP project. If doing this from a Petalinux generated embedded Linux system, the microSD can be mounted/accessed like a standard block device, typically with a device node named /dev/mmcblk0. See the Petalinux and Xilinx SDK documentation for more information. The Zybo Z7 implements one of the two available PS USB OTG interfaces on the Zynq device. A Microchip USB3320 USB 2.0 Transceiver Chip with an 8-bit ULPI interface is used as the PHY. The PHY features a complete HS-USB Physical Front-End supporting speeds of up to 480Mbs. The PHY is connected to MIO Bank 1/501, which is powered at 1.8V. The usb0 peripheral is used on the PS, connected through MIO[28-39]. The USB OTG interface can act as an embedded host or a peripheral device. The USB mode is controlled from software by manipulating the USB0 peripheral controller in the Zynq PS. When acting as a peripheral, the USB Micro AB connector (J10) should be used to connect to a USB host device, and JP1 and JP2 should not be shorted. When acting as an embedded host, the USB A connector (J11) should be used to connect to a USB peripheral device, and JP2 should be shorted while JP1 is not shorted. The Zybo Z7 should never have a peripheral device and a host device connected to these two connectors at the same time. While in host mode, the Zybo Z7 is technically an “embedded host”, because it does not provide the required 150 µF of capacitance on VBUS required to qualify as a general purpose host. It is possible to modify the Zybo Z7 so that it complies with the general purpose USB host requirements by loading C71 with a 150 µF capacitor and shorting JP1. Only those experienced at soldering small components on PCBs should attempt this rework. Most USB peripheral devices will work just fine without loading C71. Whether the Zybo Z7 is configured as an embedded host or a general purpose host, it can provide 500 mA on the 5V VBUS line. Note that loading C71 may cause the Zybo Z7 to reset when booting embedded Linux while powered from the USB port, regardless of if any USB device is connected to the host port. This is caused by the in-rush current that C71 causes when the USB host controller is enabled and the VBUS power switch (IC12) is turned on. Note that if your project uses the USB host feature (embedded or general purpose), then the Zybo Z7 is very likely to consume more current than is allowed by a USB peripheral, causing it to periodically reset. When this occurs the PGOOD LED will quickly flicker and the DONE LED will go low, indicating the PL is no longer programmed. To prevent this, power the Zybo Z7 by a 5V battery or wall adapter capable of providing more power. See section “1 Power Supplies” for information on acceptable non-USB power sources. The Zybo Z7 uses a Realtek RTL8211E-VL PHY to implement a 10/100/1000 Ethernet port for network connection. The PHY connects to MIO Bank 501 (1.8V) and interfaces to the Zynq-7000 AP SoC via RGMII for data and MDIO for management. The auxiliary interrupt (INTB) and reset (PHYRSTB) signals connect to PL pins to be accessed via EMIO. The connection diagram can be seen on Figure 10.1. After power-up the PHY starts with Auto Negotiation enabled, advertising 10/100/1000 link speeds and full duplex. If there is an Ethernet-capable partner connected, the PHY automatically establishes a link with it, even with the Zynq not configured. Two status indicator LEDs are on-board near the RJ-45 connector that indicate traffic (LD8) and valid link state (LD7). Table 10.1 shows the default behavior. The Zynq incorporates two independent Gigabit Ethernet Controllers. They implement a 10/100/1000 half/full duplex Ethernet MAC. Of these two, GEM 0 can be mapped to the MIO pins where the PHY interfaces. Since the MIO bank is powered from 1.8V, the RGMII interface uses 1.8V HSTL Class 1 drivers. For this I/O standard an external reference of 0.9V is provided in bank 501 (PS_MIO_VREF). Mapping out the correct pins and configuring the interface is handled by the Zybo Z7 Vivado board files. Although the default power-up configuration of the PHY might be enough in most applications, the MDIO bus is available for management. The RTL8211E-VL is assigned the 5-bit address 00001 on the MDIO bus. With simple register read and write commands, status information can be read out or configuration changed. The Realtek PHY follows industry-standard register map for basic configuration. The RGMII specification calls for the receive (RXC) and transmit clock (TXC) to be delayed relative to the data signals (RXD[0:3], RXCTL and TXD[0:3], TXCTL). Xilinx PCB guidelines also require this delay to be added. The RTL8211E-VL is capable of inserting a 2ns delay on both the TXC and RXC so that board traces do not need to be made longer. On an Ethernet network each node needs a unique MAC address. To this end, the one-time-programmable (OTP) region of the Quad-SPI flash has been programmed at the factory with a 48-bit globally unique EUI-48/64™ compatible identifier. The OTP address range [0x20;0x25] contains the identifier with the first byte in transmission byte order being at the lowest address. Refer to the Flash memory datasheet for information on how to access the OTP regions. When using Petalinux, this is automatically handled in the U-boot boot-loader, and the Linux system is automatically configured to use this unique MAC address. The identifier is also printed on a sticker found on the top-side of the Zybo Z7 right next to the mode jumper (JP5) and above the headphone output jack. For getting started using the ethernet port in a bare-metal application, Xilinx provides a lwip TCP/IP stack that can be automatically generated in Xilinx SDK along with an echo server example. When using the Zybo Z7 with a Petalinux generated embedded Linux system, the ethernet port will automatically appear as a network device typically named eth0. See the Petalinux and Xilinx SDK documentation for more information. For more low-level information on using the Zynq-7000 Gigabit Ethernet MAC, refer to the Xilinx Zynq Technical Reference Manual. The Zybo Z7 contains one unbuffered source port (output, labeled HDMI TX), and one buffered sink port (input, labeled HDMI RX). Both ports use HDMI type-A receptacles with the data and clock signals terminated and connected to the Zynq PL. The buffer used on the HDMI RX port works by terminating, equalizing, conditioning, and forwarding the HDMI stream between the connector and FPGA pins. The HDMI TX port does not include a buffer for improving signal integrity, but does include an HDMI multiplexer configured as a simple switch. This device is used to prevent displays from back-powering the Zybo Z7, and otherwise has no effect on functionality. The benefit this adds is to make it possible to power cycle the Zybo Z7 while a display is attached to HDMI TX, which was not possible on the Zybo. Both HDMI and DVI systems use the same TMDS signaling standard, directly supported by Zynq PL's user I/O infrastructure. Also, HDMI sources are backward compatible with DVI sinks, and vice versa. Thus, simple passive adaptors (available at most electronics stores) can be used to drive a DVI monitor or accept a DVI input. The HDMI receptacle only includes digital signals, so only DVI-D mode is possible. The 19-pin HDMI connectors include three differential data channels, one differential clock channel, five GND connections, a one-wire Consumer Electronics Control (CEC) bus, a two-wire Display Data Channel (DDC) bus that is essentially an I2C bus, a Hot Plug Detect (HPD) signal, a 5V signal capable of delivering up to 50mA, and one reserved (RES) pin. All non-power signals are wired to the Zynq PL with the exception of RES, and the CEC bus of the HDMI RX port on the Zybo Z7-10 (it is connected on the Zybo Z7-20). HDMI/DVI is a high-speed digital video stream interface using transition-minimized differential signaling (TMDS). To make proper use of either of the HDMI ports, a standard-compliant transmitter or receiver needs to be implemented in the Zynq PL. The implementation details are outside the scope of this manual. Check out the vivado-library IP Core repository on the Digilent github for ready-to-use reference IP. The IP cores for transmitting and receiving are called rgb2dvi and dvi2rgb, respectively. Whenever a sink is ready and wishes to announce its presence, it connects the 5V0 supply pin to the HPD pin. On the Zybo Z7, this is done by driving the Hot Plug Assert signal (HDMI_RX_HPD) high. Note this should only be done after a DDC channel slave has been implemented in the Zynq PL and is ready to transmit display data. The Display Data Channel, or DDC, is a collection of protocols that enable communication between the display (sink) and graphics adapter (source). The DDC2B variant is based on I2C, the bus master being the source and the bus slave the sink. When a source detects high level on the HPD pin, it queries the sink over the DDC bus for video capabilities. It determines whether the sink is DVI or HDMI-capable and what resolutions are supported. Only afterwards will video transmission begin. Refer to VESA E-DDC specifications for more information. IP supplied by Digilent in our Github repository vivado-library (Digilent github) includes DDC support and some pre-defined display descriptor data. The Consumer Electronics Control, or CEC, is an optional protocol that allows control messages to be passed around on an HDMI chain between different products. A common use case is a TV passing control messages originating from a universal remote to a DVR or satellite receiver. It is a one-wire protocol at 3.3V level connected to a Zynq PL user I/O pin. The wire can be controlled in an open-drain fashion allowing for multiple devices sharing a common CEC wire. Refer to the CEC addendum of HDMI 1.3 or later specifications for more information. An Analog Devices SSM2603 Audio Codec provides integrated digital audio processing to the Zynq-7000 AP SoC. It allows for stereo record and playback at sample rates from 8 kHz to 96 kHz. On the analog side, the codec connects to three 3.5 mm standard audio jacks. There are two inputs: a mono microphone and a stereo line in. There is one stereo output, the headphone jack. Analog power is provided by a dedicated linear power supply (IC5). The digital interface of the SSM2603 is wired to the programmable logic side of the Zynq. Audio data is transferred via the I²S protocol. Configuration is done over an I2C bus. The device address of the SSM2603 is 0011010b. All digital I/O are 3.3V level and connect to a 3.3V-powered FPGA bank. The audio codec needs to be clocked from the Zynq on the MCLK pin. This master clock will be used by the audio codec to establish the audio sampling frequency. This clock is required to be an integer multiple of the desired sampling rate. The default settings require a master clock of 12.288 Mhz, resulting in a 48 kHz sampling rate. For other frequencies and their respective configuration parameters, consult the SSM2603 datasheet. The codec has two modes: master and slave, with the slave being default. In this mode, the direction of the signals is specified in Table 12.2. When configured as master, the direction of BCLK, PBLRC and RECLRC is inverted. In this mode, the codec generates the proper frequencies for these clocks. No matter where the clocks are generated, PBDAT needs to be driven out and RECDAT sampled in sync with them. The master clock is always driven out of the Zynq. The timing diagram of an I²S stream can be seen on Figure 12.1. Note the one-cycle delay of the data stream with respect to the left/right clock changing state. Audio samples are transmitted MSB first, noted as 1 in the diagram. Figure 12.1. I²S timing diagram. The digital mute signal (MUTE) is active-low, with a pull-down resistor. This means that when not used in the design, it will stay low and the analog outputs of the codec will stay muted. To enable the analog outputs, drive this signal high. To use the audio codec in a design with non-default settings, it needs to be configured over I2C. The audio path needs to be established by configuring the (de)multiplexers and amplifiers in the codec. Some digital processing can also be done in the codec. Configuration is read out and written by accessing the register map via I2C transfers. The register map is described in the SSM2603 datasheet. A demo project that uses the Zybo Z7 audio codec in a bare-metal application can be found on the Zybo Z7 Resource Center. The audio codec is also supported in Petalinux generated embedded Linux systems, and will appear as a standard ALSA audio device. The Zybo Z7 board includes four slide switches, four push-buttons, four individual LEDs, and two tri-color LEDs connected to the Zynq PL, as shown in Figure 13.1 (the Zybo Z7-10 only has one tri-color LED). There are also two pushbuttons and one LED connected directly to the PS via MIO pins, also shown in Figure 13.1. The push-buttons and slide switches are connected to the Zynq via series resistors to prevent damage from inadvertent short circuits (a short circuit could occur if a pin assigned to a push-button or slide switch was inadvertently defined as an output). The push-buttons are “momentary” switches that normally generate a low output when they are at rest, and a high output only when they are pressed. Slide switches generate constant high or low inputs depending on their position. The high-efficiency LEDs are anode-connected to the Zynq via 330-ohm resistors, so they will turn on when a logic high voltage is applied to their respective I/O pin. Additional LEDs that are not user-accessible indicate power-on, FPGA programming status, and USB and Ethernet port status. The LED and two pushbuttons attached directly to the PS are accessed using the Zynq GPIO controller. This core is described in full in Chapter 14 of the Zynq Technical Reference Manual. The Zybo Z7-20 board contains two tri-color LEDs and the Zybo Z7-10 contains one tri-color LED. Each tri-color LED has three input signals that drive the cathodes of three smaller internal LEDs: one red, one blue, and one green. Driving the signal corresponding to one of these colors high will illuminate the internal LED. The input signals are driven by the Zynq PL through a transistor, which inverts the signals. Therefore, to light up the tri-color LED, the corresponding signals need to be driven high. The tri-color LED will emit a color dependent on the combination of internal LEDs that are currently being illuminated. For example, if the red and blue signals are driven high and green is driven low, the tri-color LED will emit a purple color. Note: Digilent strongly recommends the use of pulse-width modulation (PWM) when driving the tri-color LEDs. Driving any of the inputs to a steady logic ‘1’ will result in the LED being illuminated at an uncomfortably bright level. You can avoid this by ensuring that none of the tri-color signals are driven with more than a 50% duty cycle. Using PWM also greatly expands the potential color palette of the tri-color LED. Individually adjusting the duty cycle of each color between 50% and 0% causes the different colors to be illuminated at different intensities, allowing virtually any color to be displayed. The Zybo Z7-20 has a connector that can be used to power a fan mounted to the included heat sink. In order to attach the fan to the Zybo Z7-20 heat sink, two of the included screws must be tightened into the space between the heat sink fins (the heat sink does not contain mounting holes). The fan must be attached with the label facing down, towards the Zynq device, in order to push the air flow in the correct direction. After mounting the fan, plug the fan into the 3-pin fan connector (J14) on the Zybo Z7-20 to use it. A Zybo Z7-20 with the fan properly attached is shown in Figure 14.1. Once the fan has been installed and connected, it will always be on when the Zybo Z7-20 is turned on. It is possible to monitor the speed of the fan using the “FAN_FB_PU” signal, which is connected to the feedback signal of the fan. This generates a pulse with a frequency proportional to the rotation speed of the fan. Each rotation generates two pulses. The period of these pulses shortens with higher rotation speed and lengthens at slower speeds. If the fan speed feedback signal is held at logic high or logic low and is not changing then the fan is locked and is not spinning. 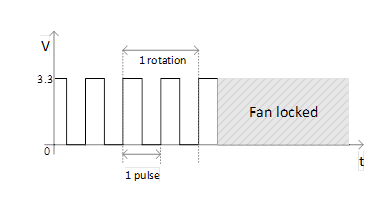 The behavior of the fan speed feedback signal is shown in Figure 14.2. It is possible to monitor the temperature of the Zynq device during operation over JTAG from the hardware server in Vivado. The maximum recommended operating temperature for the Zynq-7020 device is 85°C. 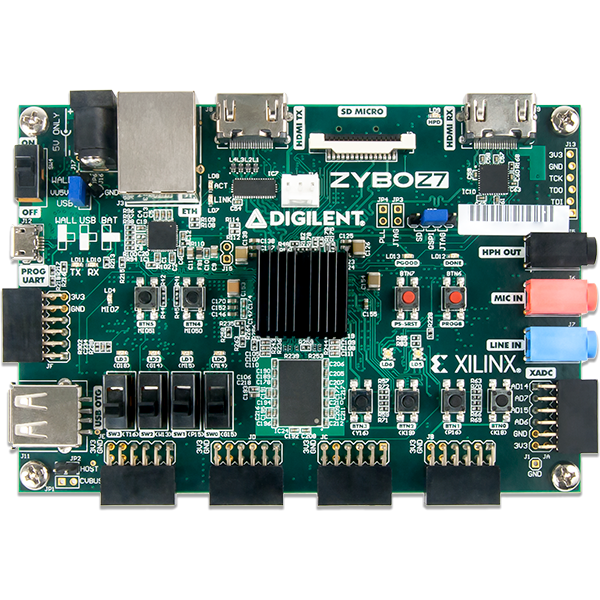 If your design causes the temperature of the Zynq to approach the maximum, Digilent recommends you turn off the Zybo Z7-20 and attach a fan before running your design again. The temperature that the Zynq reaches is largely based on the number of resources used in the Zynq PL and the rate at which they are switching. Most designs should not reach temperatures that will require a fan. When powering the Zybo Z7-20 from USB, a fan is not necessary because the current limit will cause the board to reset before a dangerous amount of heat can be generated. The fan connector is not loaded on the Zybo Z7-10 because additional cooling is typically not needed with the fewer available FPGA resources. Digilent recommends two different fan choices for the Zybo Z7-20: A Sunon MC17080V2-0000-A99 or a Sunon MF17080V2-1000G99. The Pcam port included on the Zybo Z7 is a 15-pin, 1 mm pitch, zero insertion force (ZIF) connector designed specifically for attaching camera sensor modules to host systems. The Pcam connector pin-out is rigidly defined and includes a two lane MIPI CSI-2 bus for camera data, an I2C bus for camera configuration, two additional general purpose signals, and 3.3 V for powering the camera module, as depicted in Figure 15.1 and Table 15.1. Digilent is developing a catalog of Pcam peripheral camera modules with various different types of sensors that all conform to this pin-out. The pin-out was also chosen so that many camera modules designed to work with the Raspberry Pi will also work when connected to the Pcam port. Locate the Pcam connector between the two HDMI ports. Pull directly up on the off-white colored tab to open the connector. Insert the FFC with the contacts facing the top edge, away from the center of the Zybo Z7. Ensure the FFC is fully inserted. Gently press down on both sides of the off-white colored tab to latch the FFC into the connector. The FFC is now connected properly. The MIPI CSI-2 bus is passively terminated on the Zybo Z7 and connected directly to the Zynq PL. The guidelines described in Xilinx application note XAPP894 D-PHY solutions were followed in order to implement a compatible D-PHY receiver using the Zynq. The interface is tested to operate at up to 672 Mbps on each lane. Speeds up to 950 Mbps on each lane are possible based on the Zynq-7000 timing specifications, however they are not validated on the Zybo Z7. 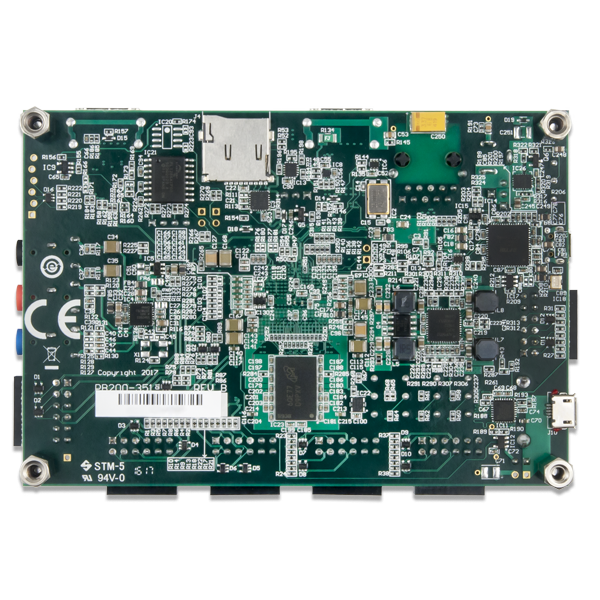 A MIPI CSI-2 Receiver IP core is available from Xilinx, and includes embedded Linux support. It requires a license in order to use, however it is possible to obtain an evaluation license from Xilinx for free. A reference implementation with a basic feature set of both D-PHY and CSI-2 will be provided by Digilent in our Github repository. Pmod ports are 2×6, right-angle, 100-mil spaced female connectors that mate with standard 2×6 pin headers. Each 12-pin Pmod port provides two 3.3V VCC signals (pins 6 and 12), two Ground signals (pins 5 and 11), and eight logic signals, as shown in Figure 16.1. The VCC and Ground pins can deliver up to 1A of current, but care must be taken not to exceed any of the power budgets of the on-board regulators or the external power supply (these are described in the “Power supplies” section). Digilent produces a large collection of Pmod accessory boards that can attach to the Pmod ports to add ready-made functions like A/D’s, D/A’s, motor drivers, sensors, and other functions. See www.digilentinc.com for more information. The vivado-library repository on the Digilent Github contains pre-made IP cores for many of these Pmods that greatly reduces the work of integrating them into your project. See the “Using Pmod IP” tutorial on the Zybo Z7 Resource Center for help using them. The Zybo Z7 has six Pmod ports, some of which behave differently than others. Each Pmod port falls into one of four categories: standard, MIO connected, XADC, or high-speed. Table 16.1 specifies which category each Pmod port falls into, and also lists the Zynq pins they are connected to. The sections that follow describe the different types of Pmods. The standard Pmod ports are connected to the Zynq PL via 200 Ohm series resistors. The series resistors prevent short circuits that can occur if the user accidentally drives a signal that is supposed to be used as an input. The downside to this added protection is that these resistors can limit the maximum switching speed of the data signals. If the Pmod being used does not require high-speed access, then the standard Pmod port should be used to help prevent damage to the devices. The MIO Pmod port is connected to the MIO bus in the Zynq PS via 200 Ohm series resistors. Like the standard Pmod port, these series resistors add protection at the cost of maximum switching speed. Since these data signals are connected to the MIO interface, they can only be accessed by the PS peripheral controller cores. The GPIO, UART, I2C, and SPI cores can all be used to drive devices connected to this Pmod. Note that the pin layout of the UART and I2C cores will not align perfectly with the typical Pmod pinouts for these interfaces. This means that UART or I2C devices connected to this Pmod may require some of the pins to be swapped around externally using individual wires between the Zybo Z7 and the Pmod. The Pmod port labeled “XADC” is wired to the auxiliary analog input pins of the PL. Depending on the Zynq PL configuration, this port can be used to input differential analog signals to the analog-to-digital converter inside the Zynq XADC core. Any or all pairs in the port can be configured either as analog input or digital input-output. In analog input mode, the voltage on these pins must be limited to 1V peak-to-peak. In digital mode, the regular VCCO-dependent limits apply. See Xilinx datasheets for more information. The Dual Analog/Digital Pmod on the Zybo Z7 differs from the rest in the routing of its traces. The eight data signals are grouped into four pairs, with the pairs routed closely coupled for better analog noise immunity. Pins 1 and 7, pins 2 and 8, pins 3 and 9, and pins 4 and 10 are paired up. Furthermore, each pair has a partially loaded anti-alias filter laid out on the PCB. The filter does not have capacitors C101-C104 loaded. In designs where such filters are desired, the capacitors can be manually loaded by the user. NOTE: The coupled routing and the anti-alias filters might limit the data speeds when used for digital signals. The XADC core within the Zynq is a dual channel 12-bit analog-to-digital converter capable of operating at 1 MSPS. Either channel can be driven by any of the auxiliary analog input pairs connected to the XADC port. The XADC core is controlled and accessed from the PL via the Dynamic Reconfiguration Port (DRP). The DRP also provides access to voltage monitors that are present on each of the Zynq's power rails, and a temperature sensor that is internal to the Zynq. For more information on using the XADC core, refer to the Xilinx document titled “7 Series FPGAs and Zynq-7000 All Programmable SoC XADC Dual 12-Bit 1 MSPS Analog-to-Digital Converter.” It is also possible to access the XADC core directly using the PS, via the “PS-XADC” interface. This interface is described in full in chapter 30 of the Zynq Technical Reference Manual. The High-speed Pmod ports use the standard Pmod connector, but have their data signals routed as impedance matched differential pairs for maximum switching speeds. They have pads for loading resistors for added protection, but the Zybo Z7 ships with these loaded as 0-Ohm shunts. With the series resistors shunted, these Pmods offer no protection against short circuits, but allow for much faster switching speeds. The signals are paired to the adjacent signals in the same row: pins 1 and 2, pins 3 and 4, pins 7 and 8, and pins 9 and 10. Traces are routed 80 ohm (+/- 10%) differential. These ports should be used only when high speed signaling is required or the other suitable ports are occupied. If used as single-ended, coupled pairs may have significant cross-talk. In applications where this is a concern, the standard Pmod port should be used. Another option would be to ground one of the signals and use its pair for the signal-ended signal. Since the High-Speed Pmods have 0-ohm shunts instead of protection resistors, the operator must take precaution to ensure that they do not cause any shorts. Although we strive to provide perfect products, we are not infallible. The Zybo Z7 is subject to the limitations below. [PSU-1] Parameter : PCW_UIPARAM_DDR_DQS_TO_CLK_DELAY_0 has negative value -0.050 . PS DDR interfaces might fail when entering negative DQS skew values. The negative values are due to CK trace being shorter than any of the four DQS traces.